Helps you to read music easily! Piano / Keyboard Note Identity Stickers are printed on high quality, waterproof, polyester translucent labels designed to be adhered to the upper part of the keys so that they can still be seen whilst playing. In all there are 29 labels covering the main four octaves of the white notes. 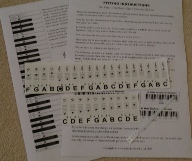 Each sticker shows the name of the key as well as the music notation in the treble (upper) and bass (lower) clefs. When no longer required, the labels can be removed without damage to your piano / keyboard. Will they fit my Keyboard? The labels are 11.1mm in width which is fine for all keyboards or pianos with full sized keys (even short keyboards with full size keys). If you are uncertain, measure the minimum width between the black keys. This new improved version is printed on high quality, long lasting, waterproof polyester. So they should last as long as you need them there - ideal for teachers! As with all my products, I offer a full money back guarantee. If you are not happy with your purchase please return the stickers unused and intact before fitting and I will be happy to give a full refund. Why aren't there any stickers for the black notes? You will notice that there is a ‘flat’ symbol to the left of many of the stickers and a ‘sharp’ sybmol to the right, indicating for instance that the black note to the left of ‘A’ is A flat and the black note to the right is Asharp. And the black note to the left of ‘B’ is B flat and A sharp. Which of these that it is actually called depends on the key signature - see my tuition books for a full explanation. So what about the notes above and below the four octave span? These notes will be above and below the Grand Staff, but by the time you get to use these notes you will understand all that you need to know and will not need any of the stickers anyway! 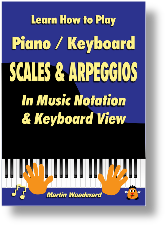 For a limited time I am also giving away a digital copy of my comprehensive Scales eBook this will be sent to your email address in pdf format and can be read on any PC, tablet or book e-reader. The normal eBook price of this alone is £4.99 and to be honest it's a bargain at that price, but it's yours for FREE with these stickers. Teachers please note: you will also have my permission to give the scale book link to your students as long as the link is passed on without payment.